An afternoon in Pachacuti, Ashbourne. Last Wednesday I spent a couple of hours sitting in Pachacuti , a Fair Trade shop in Ashbourne, Derbyshire. I had not gone there to buy anything although I was very tempted. On a previous visit I had left with three hats, two tops and a pair of shoes! Here is a photo of the shop and you can see my little suitcase outside! 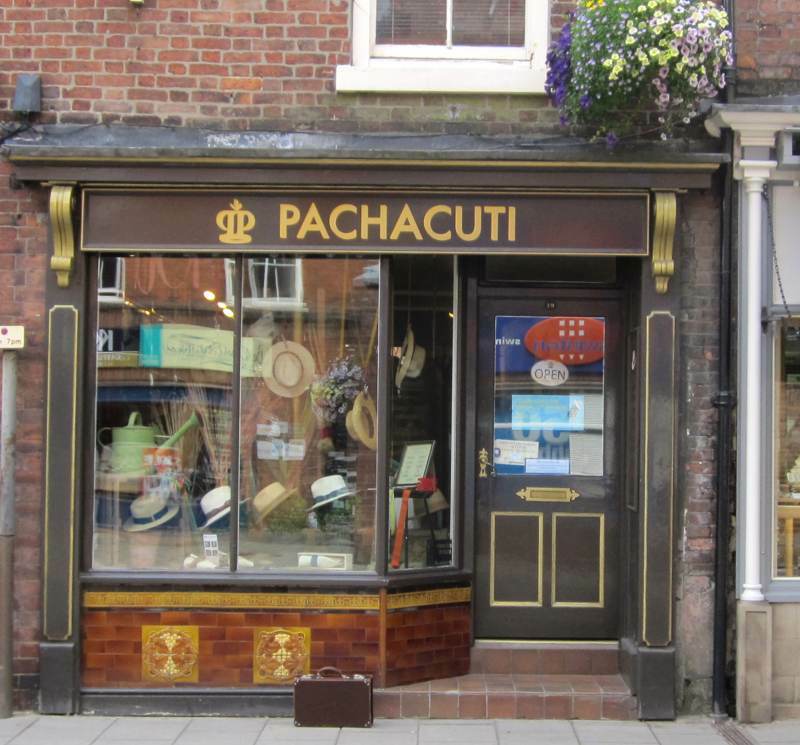 Pachacuti Shop in Ashbourne Derbyshire. Continue reading An afternoon in Pachacuti, Ashbourne. Posted on August 26, 2013 February 26, 2015 Categories Days Out, Making, ShoppingTags Craft Activism, fair trade., hate Sweatshops, Love Fashion, Mini Fashion Protest Banner, Pachacuti Ashbourne, panama hatsLeave a comment on An afternoon in Pachacuti, Ashbourne. William Morris said “Have nothing in your houses that you do not know to be useful, or believe to be beautiful” I think this is something worth considering in these times of excessive hoarding and shopping. Today it is so easy to spend money, that there is great danger of buying, without considering if we need an item, or if it is something that will make our homes more beautiful. When I had my first home in the 1980s William Morris designs were popular and I can remember having curtains and cushions in his fabric. I was therefore really interested in visiting the National Trust property Standen House in West Sussex. The house itself was designed and built for James and Margaret Beale as a weekend retreat. James was a solicitor who was involved in the opening of the great rail terminal at St Pancras. Yesterday I took two of my Grandchildren to join in with a group called the Young Embroiderers. It is the part of the Embroiderers Guild which is for young people aged 5 and above. I have recently visited Foremark Reservoir in Derbyshire for the first time. The day we went was rather dull, windy and cloudy but we still had a good time. Foremark Reservoir is in the area of the National Forest. 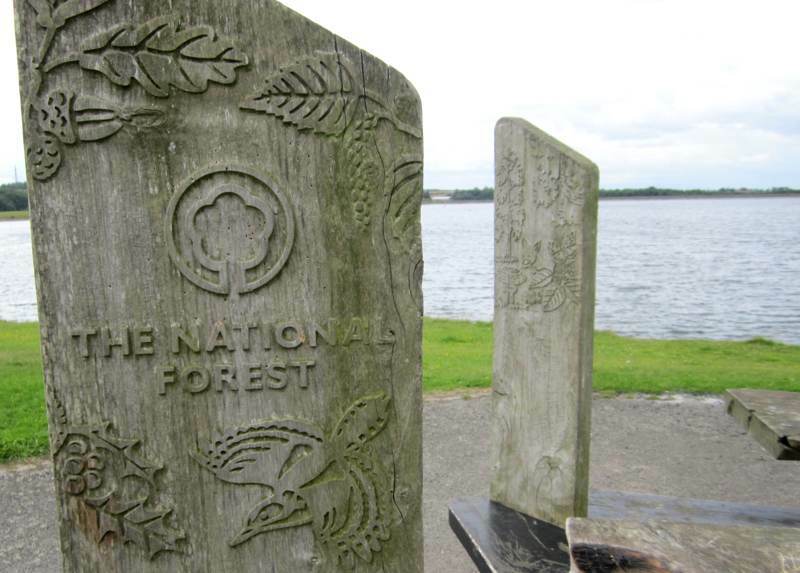 The forest covers 200 squares miles in the middle of the country and aims to eventually link the two ancient forests of Charnwood and Needwood. This post is an update on my progress with learning how to crochet. I have been writing recently about places I visit and there are plenty more of these to blog about, however I also want to write about the things I make, create and learn. I learnt to knit at about 11 years old and have knitted ever since! My knitting would come with me into school and I can remember friends saying, ‘ we can see you as a Grandmother still knitting’. I am a grandmother now and still knitting. Today I put my work out in public places for others to appreciate. This is called Yarn Bombing or Yarn Storming, it is a type of graffiti that doesn’t harm the environment. Yesterday afternoon I decided to visit Eyam Hall in Eyam, Derbyshire. Eyam Village is known as the Plague Village. This is not because there is anything wrong with it now but it goes back to 1065-6. This is when the villagers cut themselves off from the outside world so as not to spread the plague throughout the county and the north of England. About half of the inhabitants living there at that time died but they did manage to contain the disease and stop the spread. You could think it would be a sad place to visit with harrowing stories but the emphasis is more on their heroic stand, that saved many others. Today I went to Mercia Marina and ended up buying rope! The original reason for my visit was to pick up some knitting that I had done for an exhibition at the Willington Art Festival. Little did I know I would end up buying rope. My exhibit was a hoop covered in knitting to illustrate the water cycle. I don’t know why I chose to make this but the idea just popped into my head. Signs of Autumn Fruits and Seeds. I know it is still Summer and this year we are enjoying the weather and at last we can talk about the Summer of 2013. Recently I started to look for signs of Autumn fruits and seeds while walking along an old railway track at Hassop in Derbyshire. After a quick stop to eat some delicious Raspberry Pavlova Hope Valley Ice Cream, which was so good I forgot to photograph! On my walk I found lots fruits and seeds to take photos of and here they are. Continue reading Signs of Autumn Fruits and Seeds. Posted on August 9, 2013 February 26, 2015 Categories Days Out, NatureTags Autumn, Autumn fruits and seeds, Hassop Station, Hope Valley Ice Cream, walking in DerbyshireLeave a comment on Signs of Autumn Fruits and Seeds. I wanted to go shopping in Kirkby Stephen. Kirkby Stephen is a small market town about 5 miles off the A66. This is the road you travel across the country on from the A1 at Richmond in the east to Penrith and the M6 in the west. It is a fantastic road with amazing views and small towns, villages and a few castles. Travelling along the road last Monday we did a detour for some lunch and to do a little shopping in Kirkby Stephen. I have not been there before and after a good lunch had a look at the shops. It was so wet I didn’t take any pictures of the town itself as it was a case of dash into the next doorway. The High Peak Trail is one of my favourite places to walk in Derbyshire. Today is looking lovely and so the question is, where to go? Possibly to the High Peak Trail, Derbyshire! Here are a few pictures I took on my last visit. The first is of Leawood Pump House which is the pumping station which can still pump water from the River Derwent up into the Cromford Canal just beyond High Peak Junction. This is not actually on the High Peak Trail but the trail meets the Cromford Canal at High Peak Junction, very near to the Pump House.